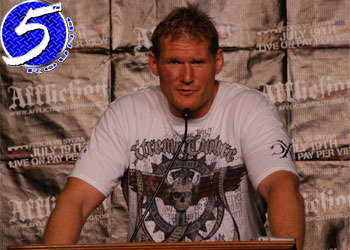 While Dan Henderson was beating down Rafael “Feijao” Cavalcante inside the Nationwide Arena in Ohio, Strikeforce heavyweight Josh Barnett was busy filming the controversial actions of the Columbus Police Department just outside of it. As he was walking the streets of the Buckeye State, Barnett whipped out his camera phone and recorded the CPD aggressively arresting WWE superstar Shad Gaspard for allegedly doing nothing wrong. “The video I took of Shad’s arrest and use of force for a charge he didn’t commit now up on TMZ,” Barnett posted on his Twitter. “The biggest part of all this is that Shad wasn’t jaywalking! I was walking in the street by the sidewalk and another friend was. Although countless cops were on the scene, it only took three of them to handcuff and pin down the 300 pound African-American. The officers on location claimed he was jaywalking, but everyone Barnett interviewed vehemently suggested otherwise. That Jose Barnett, such a good Samaritan. Please click here to watch Barnett’s riveting camerawork for TMZ.com!